Set on a bustling area between Kuala Lumpur’s Jalan Hang Lekiu and Jalan Gereja, Arenaa Star Hotel is just a five-minute walk to Masjid Jamek LRT Station. This hotel boasts a striking avant-garde architecture and a state-of-the-art fitness centre. Featuring private bathrooms with rainfall showers, all rooms are air-conditioned. Room appliances include flat screen satellite TVs, electric kettles, ironing facilities, and safety deposit boxes. Upgraded rooms add Jacuzzis and dining areas. Arenaa Star Hotel takes pride in its wading pool and spa tub for guests’ relaxation. Wi-Fi access is available all throughout for free. There is also a 24-hour front desk, parking area, and function rooms available on-site. Harry’s Bistro, the hotel’s own restaurant serves reasonable and tasty Asian and Western meals all day. 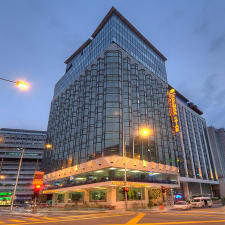 Sultan Abdul Samad Building and Merdeka Square are only ten-minute walk from this hotel. The well-known Petronas Twin Towers is ten-minute drive away. The hotel's location is unbeatable according to guests. It only took guests five minutes to reach the popular Merdeka Square, Little India and the metro station. Other famous local attractions and the city's China Town are also nearby. Guests had no difficulties finding good places to eat. There is a buffet-style restaurant on the mezzanine level of the building, which serves delicious foods at affordable prices. A coffee shop is right in front of the establishment. Furthermore, dining options offering authentic Malaysian mix of flavours are present within the neighbourhood. Those who have stayed at the upgraded rooms gave rave reviews about the comfort of their accommodations. Upgraded quarters have two air conditioning units, a huge round bed, and a private bathroom with a Jacuzzi. Many said that spending a little amount for the additional upgrade was totally worth it! There were many homeless people sleeping outside the building at night and loitering around every morning, which made the hotel guests quite uneasy. Others feared that their rooms could be opened without their permission, as there were times when the doors do not lock. Guests reported that while the air conditioners in their rooms work, it barely does anything to make the temperature lower. Moreover, many were disappointed that there were no air conditioners on the walkway from the lifts to their rooms, and that the entire hotel is too warm. Many rooms have poor lighting, with no windows and black-painted interiors, so guests are almost unable to tell if it's day or night outside. Moreover, some rooms are so small that guests compared them to pigeon holes -tight and claustrophobic.